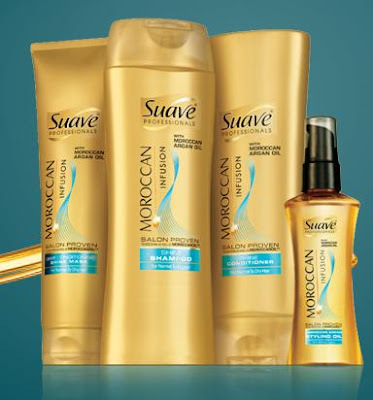 Beautiful Incentives: Suave Naturals Review & The new Shine Suite with Argan Oils! Suave Naturals Review & The new Shine Suite with Argan Oils! I am always looking for the most inexpensive choices in hair care and one of my favorite go to's for certain products has been Suave. Since I was a teen I have purchased from them and really was impressed with the quality for the price. When I couldn't afford the salon conditioners, I would try out their versions and they weren't bad! To this day, I still use their Humectant conditioner. I also enjoy many of their lotions. The quality of their products has grown a lot since my teenibop days, and along with that many different scents have been introduced. One of which I am a huge fan of, Everlasting Sunshine. I have the lotion so I decided to try the shampoo and conditioner in the same scent. This recent scent is really just so unique and intoxicating to me. I love it. I wish I could get this scent in perfume, in candles, melts, you name it. It's wonderful. The best way to describe it is slightly floral, very sweet, yet not overpowering, with a hint of something tropical and fruity. Today, I'm excited to share the Suave Naturals line shampoo and conditioner in this scent, along with another called Ocean Breeze. The naturals line has a ton of yummy scents to choose from. These are just two of them. When I am in the shower, I always have to sniff my hands before I put the shampoo and conditioner on my hair. If you don't put anything else on your hair or you use an unscented styling product, the smell of this will linger in your hair for quite a while. I catch myself sniffing my hair often. The Ocean Breeze scent is more of a refreshing scent that I have to be in the mood for, but I definitely like that as well. Sometimes I will be in the mood after I do yoga and have a semi cool shower to cool off. It kind of adds to the experience, like getting into the pool on a hot summer day. The sea blue color of the bottle lends to that occasion. It performs just as well as the Everlasting Sunshine. I find that the conditioners in this line do pretty well and the shampoo does not strip my hair down. It left my hair soft and smooth. My ends are a lot softer when I use this. For the money, the quality in Suave is something I think everyone should check out. They are one of the better drugstore brands, which will run 1/4 the cost of others! Speaking of Quality...Right now, I have some exciting news about the new Suave line! Nicole Ricci has teamed up with Suave Professionals to get the word out on all their new products in their Salon proven Moroccan Infusion product line If you haven't already heard, they have all new products containing Moroccan Argan oil and the reviews have been very promising. Check out the Shine Suite Sweeps and enter for your chance to win some! Each day you sign in earns you a new chance to win free products, cool prizes or even $100,000! Suave is also proud to sponsor the NBC Show, Fashion Star, where you will see many celebs sporting the new Shine Suite looks! It's so exciting to see Suave break new ground with this new ingredient and can't wait to experience the Shine Suite for myself!! You can always count on Suave to come out with an affordable version of the more expensive brands and it will perform just as well! If you'd like to learn more and keep up with the latest promotions, add them on Facebook and follow their Twitter. Good luck in the Sweepstakes. I know I'm entering! 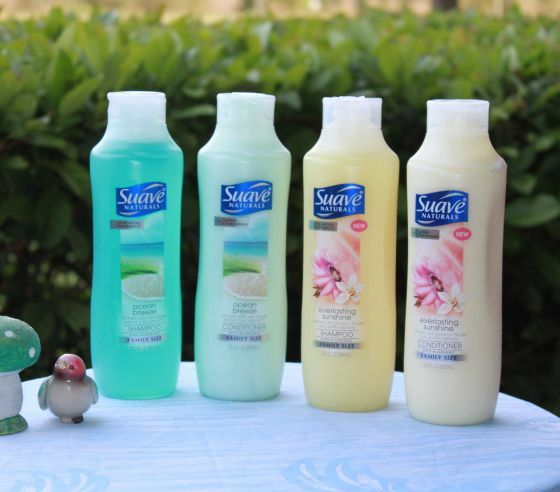 I have always relyed on Suave for affordable and quality shampoo and conditioner for my family :) Here they are always under 2.00 a bottle and so are all the products! this great ! Thanks I love them! Nice!! I love that Suave has all these new scents, and professional lines. Finally something I can afford!! The scents are amazing! And the affordability is awesome. Thanks for sharing with us! Sauve is a go to in our house. I dont think I've tried the naturals sents yet but I'll be looking for them now! the colors really makes you think of spring. love the prices too. I love suave but I haven't used it in a while, don't they have a sweet pea scent?!?! I think i'm thinking of the right people, and if I am, it rocks! I don't like their Keratin stuff though, it makes my hair like straw but love the regular stuff! I hope im thinking of the right product!! Thanks for a look at these, I hadn't seen te maroccan infusion collection before!! I love Suave's new scent Ocean Breeze! It makes me think of vacation! Love the review...lots of good information. Suave has some good stuff. love the review! You gave so much insite to the Suave brand... They are really working hard to compete with their competitors! Love the review and Suave is always an affordable product!! Great review, I am heading to the website to enter the sweepstake. Suave has always been a fav of mine! They make my hair feel so good. We love Suave in our home I'll be looking for these new scents next time! I love Suave! The strawberry shampoo is my favorite!!! Very reasonably priced and works great! Suave products are so affordable! They are in my family budget and it seems like you get the results that you want with Suave too.